India’s top environmental watchdog, Central Pollution Control Board (CPCB), has found Varanasi to be the most toxic city of the country. Notorious for water pollution because of the Ganga river, Varanasi is known to be the most polluted stretch in the country. 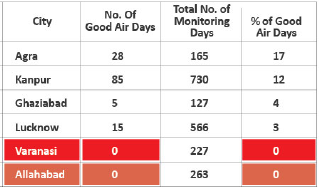 However, how the CPCB has now found that of the 227 days for which it measured air quality, the holy city recorded zero good air days. Quoted in a just-released report, titled “Varanasi Chokes! Particulate Matter Trends and Increasing Respiratory Ailments”, prepared by IndiaSpend, a data analysis site, the CPCB has found that the only other city which has zero good air days is also in Uttar Pradesh – Allahabad. In order to provide a comparison, the CPCB provides data for other Uttar Pradesh cities. Thus, Agra has 17 per cent good air days (28 out of 165 days monitored); Kanpur 12 per cent (85 out of 730 days); Ghaziabad four per cent (five out of 127 days); and Lucknow three per cent (15 out of 566 days). Yet, the report suggests, the high level of air pollution was ignored, even though it was identified in 2009, when the Ministry of Environment and Forests issued a nationwide index to help identify critically polluted zones across the country. “The Comprehensive Environmental Pollution Index (CEPI) identified 43 critically polluted zones by taking into account the pollution levels in air, water and soil. Uttar Pradesh has six out of 43 polluted zones in the country – Singrauli, Ghaziabad, Noida, Kanpur, Agra and Varanasi”, the report notes. Particulate matter, says the report, results in increased air pollution levels and is one of the key components responsible for asthma, chronic lung diseases and even heart diseases, with its impact being felt on the vulnerable sections of the population – children and the elderly. 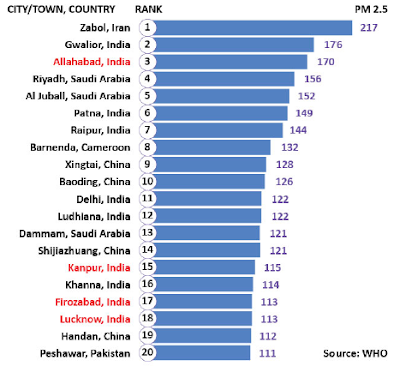 Interestingly, this year, the World Health Organization (WHO) has listed of 20 most polluted cities in the world, 10 of them from India. Four of these ten are from UP – Allahabad, Kanpur, Firozabad and Lucknow. Varanasi is not on the WHO’s list; yet, CPCB has found the Prime Minister’s constituency has having India’s worst air quality.